Whiteflat, Texas; Ghost Town Whiteflat, Texas. 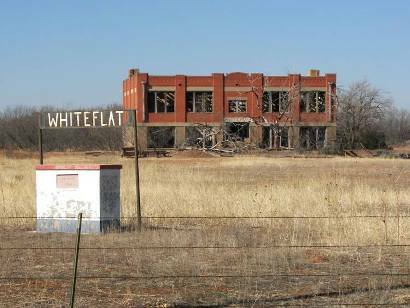 Whiteflat was originally a Matador Ranch line camp. Either Bill Tilson or Mrs. H. H. Campbell named the town in 1899 for the abundant white needlegrass.The town was established between the geographic features of Willow Creek and Tom Ball Canyon. 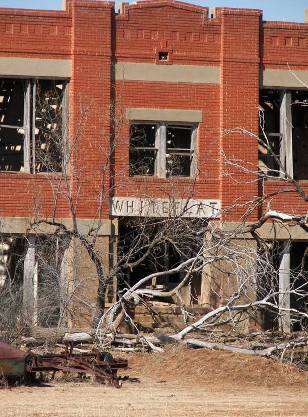 By 1910 Whiteflat had a school and the population reportedly reached several hundred. 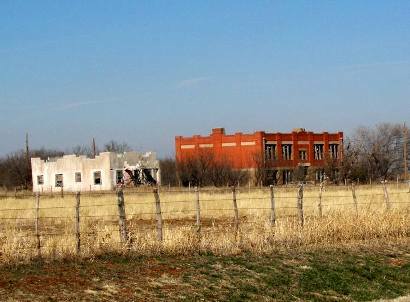 The high school dates from the 1920s when the town also had a cotton gin and post office. According to the Handbook of Texas, "early families included the Tilsons, Bloodworths, Wilkinsons, Morrisses, and Kimbells." The population was a mere 50 in the late 1940s - the period of increased mobility and school consolidations. The proximity of Matador was the biggest contributor to Whiteflat's decline. In 1980 the population was down to only 20 and the Texas highway map of 2000 shows an estimated population of three people. The post office and all businesses have long been closed. The old Whiteflat school. 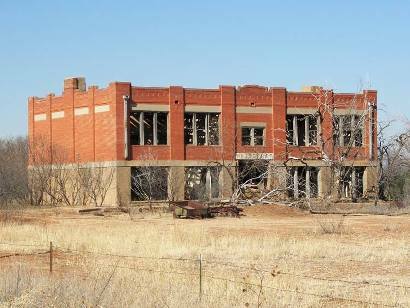 "It's now overgrown and horses are kept on the land behind the school building." I happened across Whiteflat while driving back from a hiking trip with my son Erich (Labor Day weekend). Whiteflat is in the panhandle (Motley County) on highway 70 between Turkey and Matador. The current local population can't be more than a handful as I saw only one home that looked as if it might be occupied (though we did not explore the area very long). I've provided copies of three of the photos I took during our visit. 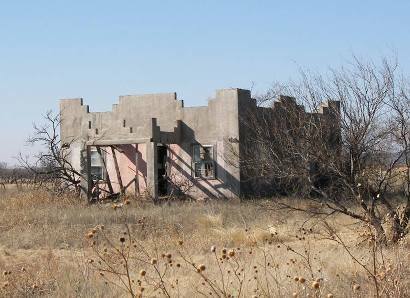 This area of Motley County was first called "White Flat" due to the tall white needlegrass which covered the flat prairie land. 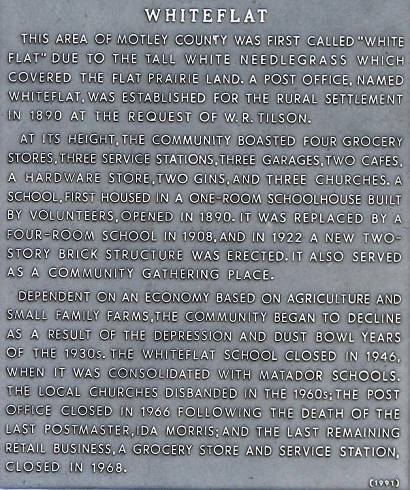 A post office, named Whiteflat, was established for the rural settlement in 1890 at the request of W.R. Tilson. 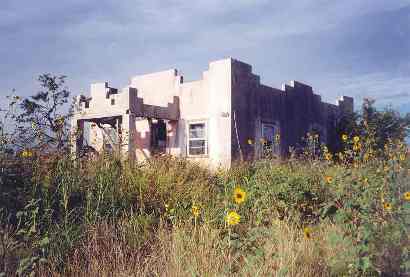 Dependent on an economy based on agriculture and small family farms, the community began to decline as a result of the depression and dust bowl years of the 1930s. 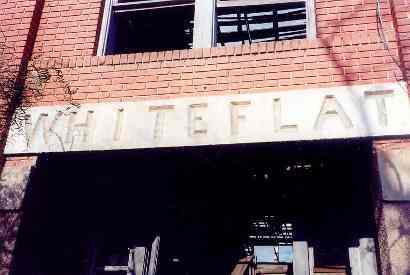 The Whiteflat school closed in 1946, when it was consolidated with Matador schools. The local churches disbanded in the 1960s; the post office closed in 1966 following the death of the last postmaster, Ida Morris; and the last remaining retail business, a grocery store and service station closed in 1968. 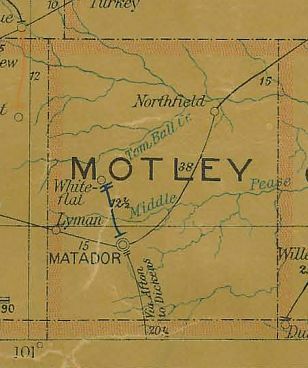 1907 Motley County postal map showing Whiteflat. 1. The school hired some local boys to drive to the surrounding farms in a covered wagon to bring the children to school. 2. The school did not have a storm shelter. Instead there was a large ditch next to the building. If a tornado was sighted the students and teachers would lie down in the ditch. I grew up in Whiteflat and the white building was the parsonage for the Methodist Church which I attended in the 1950 until it closed in the 1960. 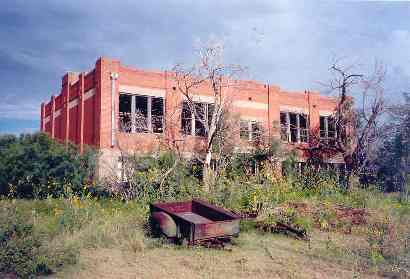 The old school building was used in the 50's and 60's to hold elections and I can remember attending a Halloween haunted house there put on by the Home Demonstration Club.